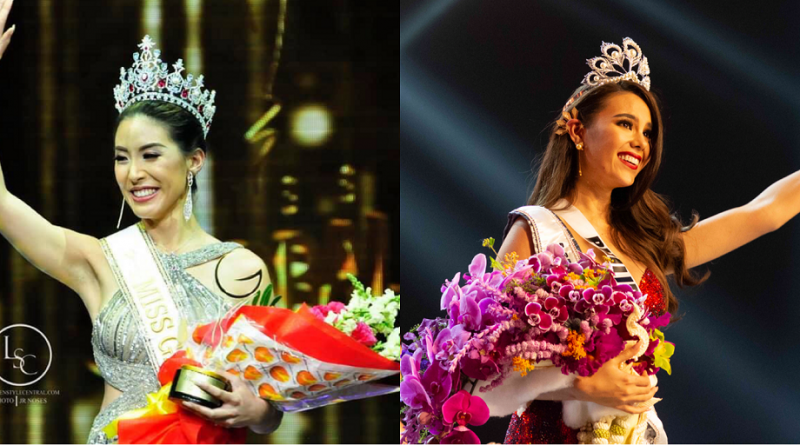 Miss Hong Kong, Sophia Ng, bested more than 40 candidates during the coronation night of Miss Global 2018 pageant held on February 11, at Newport Performing Arts Theater in Resorts World Manila. A psychology therapist by profession, she now holds as the first ever Miss Global titleholder from her country as well as in Asia. Joining her court are Miss Canada Amber Lynn Bernachi as first runner-up, Miss Uzbekistan Tamila Khodjaeva as 2nd runner-up, Miss Haiti Seydina Allen as third runner-up and Miss USA Pamela Lee Urbina as 4th runner-up. 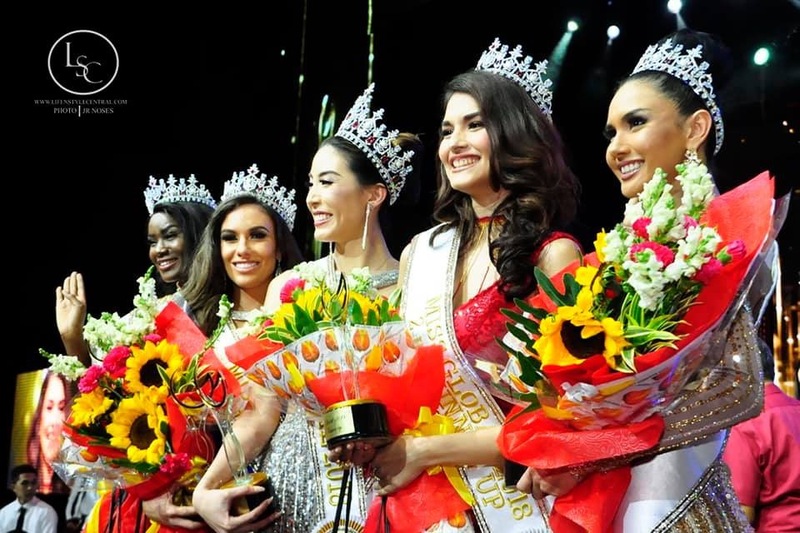 From left to right: Miss Haiti Seydina Allen (3rd runner-up), Miss Canada Amber Lynn Bernachi (1st runner-up), Miss Miss Hong Kong Sophia Ng (Miss Global 2018), Miss Uzbekistan Tamila Khodjaeva (2nd runner-up) and Miss USA Pamela Lee Urbina (4th runner-up). The pageant had a “Steve Harvey” moment last night. The host, Ethan Salvador, had a mistake announcing the 2nd runner-up. He first called Miss Canada as the 2nd runner-up. After few minutes, he apologized to the crowd and corrected himself by announcing Miss Uzbekistan as the real 2nd runner-up. Philippine candidate, Eileen Gonzales, managed to reach in the Top 20. During the Top 11 question and answer round, Ng mentioned that the beauty queen she look up to is the reigning Miss Universe Catriona Gray. “I really look up to Catriona Gray of course. She really embodies what a beauty queen should be. She is empowered, she is kind, (and) she is compassionate. She is doing pageants for a purpose, not just to be pretty. She is using her platform to promote education, better education in the Philippines.” That’s so powerful,” addressed Ng to the judges. “And I think that education is something that nobody can’t take away from anybody. For her to use her platform and for her to use Miss Universe as her stage, is such a beautiful thing. She is beautiful inside and out.” she added. Sophia Ng, Miss Global; Hongkong 2018 is crowned Miss Global 2018 at the recently concluded pageant on Tuesday morning, December 12, 2018 at the Newport Performing Arts Theater in Resorts World Manila. The Final Top 5 candidates were asked the first thing they would do if crowned Miss Global. “In the US where I currently lived and in Hong Kong, I am all about educating the masses and talking about my experiences as a therapist. My experiences having had to live through depression. In sharing and inspiring others to tell them that it’s ok not to be ok but also offer them solutions is something I would consider to do.” she added. According to the pageant’s website, the winner will travel throughout the world to participate in charitable fundraisers while promoting the beauty, intelligence, and charm of women throughout the world.